An Italian scientist has created a robot wine fermenter that wouldn’t look out of place in Star Wars, whose sensors can measure the amount of wine it creates. 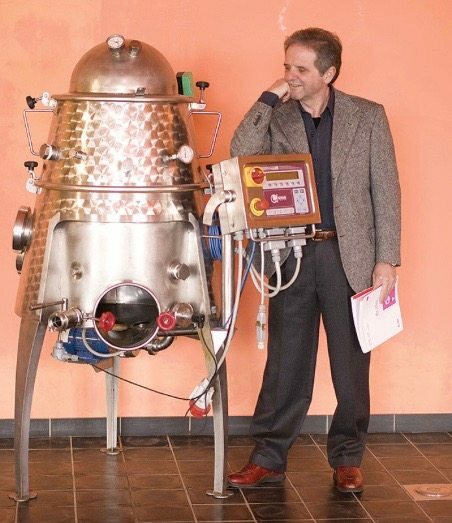 The Genesis wine robot is the brainchild of Dr. Donato Lanati, head of Italian wine research company Enosis Meraviglia based in Piedmont. The robot, which bares a striking resemblance to Star Wars character R2-D2, is able to house 200 kilograms of grapes and can produce 100 litres of wine. After an initial fermentation in the robot, Lanati then transfers the wine to a temperature-controlled lab filled with coloured lamps for further fermentation. The robot has been designed to bring out the best in every grape using sensors that can measure sugar potential, pH levels and extractable anthocyanins. It is also able to control maceration, oxygenation and racking. Its head and body operate as separate tanks that can be viewed through a Plexiglas hatch. Lanai will use the Genesis to make wine from indigenous grapes grown in experimental vineyards in Piedmont, Calabria, Sicily, Sardinia and Tuscany.